Camping and road trips with family and friends are typically fun vacations to participate in. 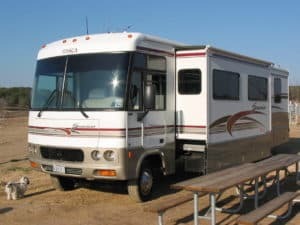 When you’re going to be away from your home for a long time period, it is often convenient and more relaxing to rent a larger recreational vehicle (RV) rather than trying to fit the entire family into a regular car. While living and sleeping arrangements are much more enjoyable and spacious, maneuvering these large vehicles can be very difficult. Not only do they have many more blind spots, but they are also much heavier and take longer to accelerate or brake. RV accidents can happen in a snap of a finger to anyone inexperienced in driving such large vehicles. Fatigue: it is common to drive for several hours at a time while traveling in an RV. This can easily lead to reduced sleep and fatigue. Falling asleep at the wheel is dangerous as it is while driving a regular car, but even more dangerous while driving a heavy and large vehicle such as an RV. Difficult Turns: It is always more difficult to make turns while driving a larger vehicle. If you try to make a tight turn, you risk hitting something. If you try making a turn too fast, you risk rolling the RV over, causing damage and potential injuries or death. Drinking and Driving: It is understandable to want to have a few drinks while vacationing. However, drinking while controlling a large RV is not only against the law but also extremely unsafe. If you’re going to be drinking, don’t drive any vehicle. Vehicle Malfunctions: If you’re renting from a company, they are required to maintain their rental vehicles and make sure that they are working properly for renters to drive. However, there are times when a malfunction can be overlooked, and an RV can run into serious problems. The first thing you should do if you are ever in any sort of vehicle accident is to seek medical attention for yourself and the people involved. Furthermore, document as much as you can so everything will stay fresh in your mind. Write down notes, take photos, and capture videos. The shock of an accident can cause you to forget important information later on. You should also speak with an attorney as soon as you can so he or she can analyze what happened and help you receive compensation for injuries that you have endured. On the other hand, things you shouldn’t do is speak about the accident on social media. It is far too easy for any insurance company to simply look up your online profile on any social media site that you use and try to use anything you say against you. This can hinder your chances of receiving fair insurance compensation. Furthermore, you should avoid speaking with any insurance provider. Often, they will try to contact you for a statement, but you are under no obligation to speak with them. Instead, have your attorney conversate with them. If you are involved in an RV accident, you need an experienced attorney to help you receive fair compensation for your injuries. Contact The O’Brien Law Firm at your earliest convenience so our attorneys can go over what happened and start working for you. Reach us at: (716) 907-7777. Driving heavy commercial trucks requires additional skills and expertise over driving a regular sized vehicle. Trucks are heavier, much more difficult to handle, and can cause serious accidents leading to property damage, personal injuries, and even death. Therefore, it makes sense that there are different rules that apply solely to commercial truck drivers with strict repercussions for any truck driver who violates these rules. In addition to the skills and expertise requirements, truck drivers must also be ready for the mentality of driving such a large vehicle on specified deadlines. They must drive for very long hours alone with the same scenery often. This can lead to exhaustion, stress, depression, and frustration. All these feelings are never positive while driving because they can worsen a driver’s concentration, focus, and ability to handle a vehicle. Truck drivers are held to a higher standard than other drivers on the road. To obtain a commercial driver’s license, truck drivers must pass background and medical checks to make sure that they are fit for the position. They must also successfully pass tests to prove their skills and knowledge on how to handle the class of commercial vehicle they wish to drive (classes A-C). If a driver has to transport hazardous material, he or she also has to pass another test to prove skills of handling and transporting hazardous material. Courses focused solely on the class of vehicle drivers wish to obtain a license for are available. Obtaining a commercial driver’s license justifiably takes more steps than obtaining a regular driver’s license. Truck drivers who violate road laws may face their license being suspended, canceled, or revoked. Depending on the violation, truck drivers could lose their licenses for certain periods of time or even be disqualified for life. Furthermore, truck drivers can also be sentenced to jail and fined. Violations include driving under the influence, having a .04% BAC or higher while driving a commercial vehicle, driving recklessly, and other driving infractions. Violations that only apply to commercial truck drivers include having an oversized load, inaccurate log books, and driving on roads that restrict commercial trucks. Even when truck drivers drive their own personal vehicles off-duty and commit a road offense, their commercial driving license can potentially be disqualified. Truck accidents have caused pileups on the highway as well as permanent injuries and death. Injuries include whiplash, seatbelt injuries, and back pain. Fires in the middle of the road and unsecured spills have occurred causing hazards to all people in the near vicinity. Road regulations are strictly enforced to avoid these types of accidents, but nevertheless accidents occur, which is why people are required to have insurance for commercial trucks in New York. In fact, New York mandates minimum coverages for property damage, bodily injuries, and death coverage. Commercial insurance is needed even if an employer uses his or her own pickup truck for business purposes as personal insurance will not cover such expenses. If you are injured in an accident involving a truck, you need to be compensated. The experienced attorneys at O’Brien are available for a free initial consultation to discuss your potential claim. Call us today at (716) 907-7777. Off-roading and overlanding have become increasingly popular these past few years. Many people enjoy going out onto trails and roads that not everyone gets to ride on. Major car companies have caught on to this new hobby and are manufacturing vehicles built for these roads that are still available to use as daily drivers. In particular, the demand for high-powered off-road trucks has grown in popularity. While you’ll want to go out and have fun with your recreational truck, there are serious accidents that can happen, so you always have to be cautious. 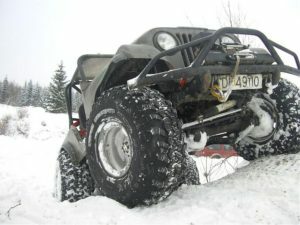 One of the biggest concerns for most off-roaders is being stranded. Oftentimes, these trails don’t have cell service. Not many authorities are there to help either. If something is to happen to your off-road camping vehicle such as getting stuck in the mud, running out of gas, or simply breaking down, you’re going to need to have planned ahead for the worse, just in case. When you are driving on the trails, you’re bound to come across puddles. While puddles aren’t big deals on maintained gravel roads, that is not the case when you’re out on trails and have no way of knowing how deep a puddle is. Water puddles can be a few inches deep, but they could also be much deeper and cause damage to your recreational truck. Additionally, mud causes vehicles to slide and tires to lose traction. You can easily get stuck or slide in mud and require someone to pull you out. You might think that you are alone out in the wilderness, but you have to remember that there are animals living around you. Depending on your location, you might have to watch out for deer, bears, and other predators in the woods that may jump out of nowhere into the middle of your path. Heavier trucks are more difficult to reach to a full stop so large animals can not only damage your truck, but also cause serious injuries from swerving into a tree or hitting the animal. While you’re on trails, it’s easy not to realize that you are out on a public road because there are often not many people out there. However, you have to recognize that there can be other people near you driving their recreational vehicles. There are often no speed limits set out on these trails or no authorities to enforce them, so it is easier to inadvertently speed. Driving at a reasonable speed in case another person drives out in front of you from a connected or hidden path will allow you to stop in time. Whether you’re with friends, family, or a group of fellow off-roaders, you should recognize that there are dangers out on the seemingly peaceful wilderness. It’s better to be overly cautious than caught off guard in a bad situation. If you or a close family member is involved in any kind of truck accident, The O’Brien Law Firm can help. When you pursue a personal injury claim, you need professionals that will be there for you. Call us today at (716) 907-7777 for a free, no-obligation consultation. Truck accidents can often be more devastating than a typical car accident because of how big and heavy trucks are. Trucks have caused massive spills on the road requiring long and tedious clean ups in addition to deadly highway pileups. 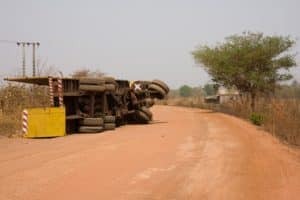 In addition to road accidents, there are many accidents that happen off the road, such as when employees are required to work with trucks in their line of work. No one should feel unsafe at work. If a work-related injury happens to you, our attorneys know how to help. Many jobs require being familiar with big trucks including industrial, towing, and dump trucks. According to the United States Department of Labor, there are costly work-related accidents involving trucks multiple times every month. Depending on the job, accidents include electrocution, being crushed and killed, and having amputated limbs. Whichever situation you or your close family member is in, you can sue for workers’ compensation when an injury happens at work. If a work-related accident occurs, the first thing to do is contact the authorities. Medical attention may be needed. After, you should always speak with an attorney as soon as possible. Write down exactly what happened so that you can refresh your memory in the future if you ever need to. After considering all your options, an attorney will then be able to take the following steps on his or her part to pursue a lawsuit if you decide to sue. 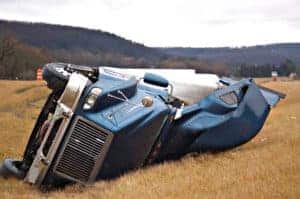 If you are involved in a work-related truck accident, you can always count on the diligent attorneys at The O’Brien Law Firm to help you figure out what to do next. Call us today at (716) 907-7777 for a free consultation so we can discuss all your options. We look forward to talking with you.